Here is a brief description of how I sand my bowls. I first began using soft disc sanding when I was introduced to it in a workshop on stack laminated furniture around 1983 with Doug Sigler. Then about 1985 I took a workshop with David Ellsworth and he extolled disc sanding virtues even further. We're talking rpm's. Sanding while the bowl is stationary allows you to deal with voids, the natural edges, out-of-round bowls, and end grain. Over the years I have refined various aspects of the soft disc sanding and have ending up with a system that works fairly well. We all wish there was a way to sand faster, if not eliminate altogether, but it is unavoidable for an smooth consistend finished product. The backbone of my sanding is the Makita GV5000 sander/polisher. It is light and compact, allowing me to hold it close to the head, reducing arm fatigue. You can lock it on so you don't have to keep holding the trigger. It runs at 4000 rpm, way too fast for the foam or sandpaper, so I rigged up a standard household dimmer switch ganged to a duplex outlet and am able to dial in the preferred speed at will: faster with coarser grits, slower for the fine. No more wearing out the switch triggering it on and off to slow the sander down. The dimmer does not seem to harm the sander at all, witness I am still using the old 1984 one daily. I added a second duplex outlet to my dimmer switch, and now can switch back and forth between grits quickly as I work my way through sanding a piece. I believe my general speed is around 2,500 rpm. Some years back I got worried Makita might discontinue the model, and as I had not found anything comparable, I bought a second, a third, and now I have one for each grit. It speeds things up. If you have two sanders you can alternate which one you switch to a finer grit, leap-frogging your way to the finest. For example, sand a bowl with 80 grit, move to the second sander for 120 grit, and if you come across a spot you missed pick up the 80 grit to fix it and then go back over with 120 grit. Now pull off the 80 and put on 220. Sand the whole bowl, and again, if you find a spot of 80 swirls you didn't quite get off, pick up the 120 and get rid of it. The 220 is pretty good at showing off scratches. Now replace the 120 with 320 and sand all over with that. Again, you are easily able to pick up the 220 if there is a spot the 320 can't easily work out. My last pass is with 500 grit It has been my experience that a light touch with the sander will leave the paper sharper longer and increase the amount of wood you are able to sand. It is all too easy to bear down on one spot to get a scratch out, but as the wood and paper heat up the grit is quickly glazed and the cutting action becomes polishing. 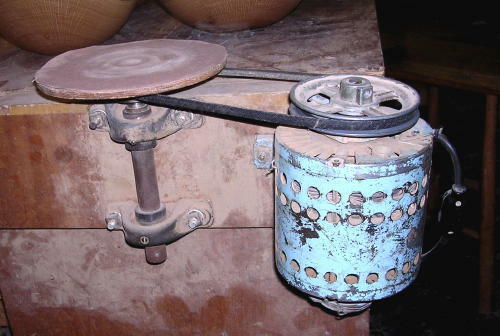 Commensurate with the hand-held sander is a braking system on the lathe. When I had a variable speed DC motor I found it acted as a brake in the opposite direction it was set to run. This helped hold the bowl in place as I was sanding. When I switched to variable speed AC motor I lost this feature. But then I passed a length of 3/8" O.D. rubber gas line from the auto parts store around the 4" drive pulley, and voila, a slip brake in both directions, easy to nudge forward with a hand but firm enough to resist the torque of sanding. I upgraded to a triple drive pulley so a groove is always available to drop the rubber over for sanding. A real advantage to this system is it frees up both hands to hold the sander. This greatly reduces the stress on the forearm that I found left me aching after a period of one-armed sanding. Plus, using two hands you are able to "float" the sander in your hands as you arc back and forth over the complex curves of a bowl, as well as gently sand around the top or the bowl to ease the sharp edges. For the denser grey foam that is applied below the DuraFlex D44, I use the EVA closed cell foam, available at Foamorder at http://www.foamorder.com/closedcell.html A .2' square piece 1/2" thick runs $12 plus shipping. I prime the leather with a thin film of the 3M Feathering Disc Adhesive which is good for the life of the leather. If anything the grip is too strong. You have to peel the paper off carefully to avoid damaging the leather/foam connection. A light pass with a propane torch will soften the glue to release it from the leather. If the sandpaper sticks too tight, dusting the leather surface with the dust on your palms before putting on the next piece of sandpaper will help. I have been using 3M Gold, but now I use Mirka Gold, which seems to have much more consistent grit with way fewer deep scratch marks left over moving from one grit to a finer grit. You can find it on Amazon. I usually start with 100 grit, the move to 120, 220, 320, and finally 500 grit. If the wood is hard and the cut clean I can start with 120 grit. It is very seldom that I can start with 220 grit. It is quicker to use 120 to get things even, then move on to the 220 grit. Each successive grit takes less time. To see the step by step process of making a custom sander, go to the Custom Sander page. Finally, although not a physically jolting as using the gouge, sanding can be quite hard on the joints and can make your arms ache. It is important to hold the sander as loosely as possible and to avoid tensing or hunching over the work. Having a sander that has a lock-on button is important, for it frees you up to hold the sander with both hands in the best way possible to loop freely over the rounded surface of the bowl using both arms and the whole body, not just one arm locked tight to the shoulder. My photo does not quite catch the effect, for I am not holding the trigger on though my finger is in the area. You can see the flex of the foam melding to the bowl in this older shot. After stationary sanding to finest grit I go to ScotchBrite. On a round bowl this is easy with the bowl spinning, but on a natural edge bowl you have to rub some parts by hand. Then I tried sticking some to a hook and loop disc and found it a great improvement. The soft foam 3" dia disc sold by The Sanding Glove mounted on a high speed Sioux 45 deg. angle head drill makes a fine final polisher for any kind of bowl. I start with 3M grey-green fine #7448, then go to the gold very fine #7745, and end up with the white ultra fine #7445 than buffs. This sequence almost polishes the bowl at the end, and can be effectively used to buff out blemishes and scratches later on. It seems to blend the Behlen's Salad Bowl Finish right over the offending area. For more aggressive buffing at the start use the maroon 7447, but it leaves visible scratches. When I have a batch of bowls that have dried and are ready to have the bottoms flattened and signed, that wonderfully sanded surface is all rough from raised grain and has to be re-sanded before the final coat of finish can go on. Even using the Makita with the softest foam and finest grit can leave swirl marks at this stage, and my arm would ache after doing a dozen bowls in a row. So I bought a DeWalt DW423 random orbital sander, removed the dust hood and cut it down to 4" dia. This is hook and loop, so I glued a foam/leather system to a worn piece of hook and loop paper, stuck it on, and put on a piece 600 grit paper. This sander is easy on the forearm because you can hold it right behind the foam. It cuts the raised grain without leaving much of a sanding mark. Such a system may be good for various other uses. After the DeWalt hook grew weak I sanded it off and glued the foam directly to it. I use a stationary sander to flatten the bottom of bowls…..8" dia plywood disc glued to a pulley mounted to a vertical shaft, running at 1800 rpm. With 80 to 150 grit paper glued on it cuts the warped bottom flat. Those sanding marks are then removed with the flexible foam sanders.